If you've had an opportunity to set up a home audio system, there's a good chance you've used RCA cables to connect audio sources, receivers/amplifiers, and maybe even speakers. An RCA jack is how an RCA cable connects to hardware. RCA jacks have been around for many decades and can still be found in plenty of modern audio/video devices. They support content through receivers, amplifiers, speakers, TVs, media centers, and even high-end sound cards for desktop computers. Although newer forms of input/output connections have been developed (like HDMI, optical, coaxial digital), RCA jacks are still widely available. They exist in many audio/video sources, such as CD players, DVD players, VCRs, digital media players, turntables, video cameras/camcorders, gaming consoles (e.g. Xbox, PlayStation, Wii), and more. RCA is pronounced ahr•see•ey. RCA jacks are also called RCA plugs and phono connectors. An RCA jack consists of a small, circular hole ringed with metal. The connector is normally color-coded or a nearby color panel is included on the device that describes which RCA cable plugs into which RCA jack. When used in conjunction with an RCA cable, which features a male connector that mounts firmly into the jack, it becomes possible for analog or digital information to pass from the input source to the output destination. An RCA jack can often be used to connect the analog output of a DVD player to the analog inputs located on the rear side of a television. However, RCA inputs can also be found on other devices and even on the front of a television. The red and white colors represent the right and left stereo audio channels, respectively. A yellow connection (composite cable) is used to deliver the video signal. RCA technology was developed by the Radio Corporation of America to connect a record player to an amplifier. Today, RCA jacks are commonly found connecting various components in many audio-video systems. Basic connections feature the simple red and white for right and left stereo channels. 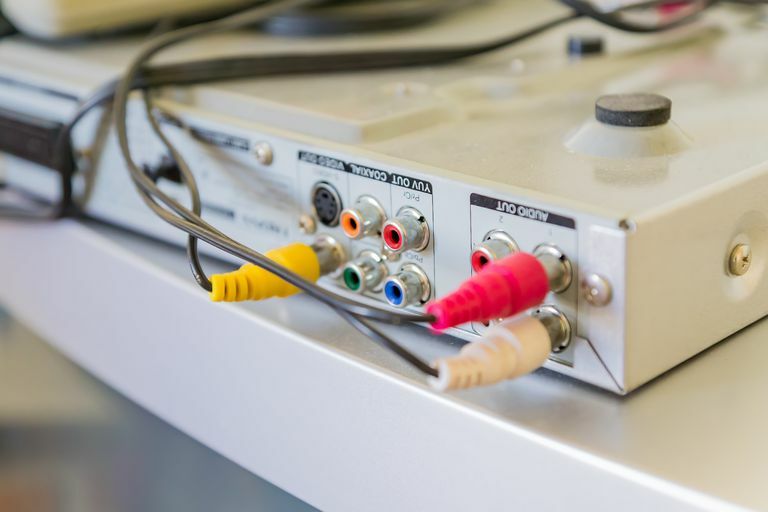 Yellow is used for composite video, while component video connections (typically colored green, blue, and red) can be found on more complex equipment. Surround sound stereo systems can feature additional colors for the separate speaker channels. RCA jacks are even used for coaxial digital audio (colored orange) signals or antenna connections. RCA cables are sometimes found in conjunction with an S-video (higher video quality versus a yellow composite) plug end. Ports are typically labeled to avoid color confusion. If audio equipment is turned on, one may encounter a buzzing sound as the cable end plugs into the RCA jack. This is due to the signal connection being made before the ground connection, hence why it's recommended to turn everything off before handling the cables. RCA jacks are still in use today likely because of a combination of ease of use, low cost of manufacturing, reliability, and global acceptance. How Do You Hook Up Component Video Cables to Your TV?